Members of We Are Change UK went to Parliament Square armed with boxes of chalk. Despite being in the SOCPA zone no applications were submitted and no arrests were made. Members of We Are Change UK interview ex BBC World presenter, Phil Hayton. Enjoy! Elephant in the Room wins Best British Documentary!! again thank anyone who came along on Monday. 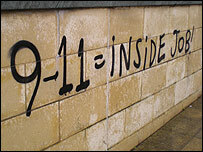 We Are Change UK take part in the 11th or every month action that calls for a new investigation into the events of 9/11. 3000 citizens from around the world died on the day of 9/11 and millions since in wars as part of the War on Terror. The debate in parliament to ratify this treaty and for it to become British law started on Monday 21 January 2008. There is a 3 line whip for Labour MP's to vote in favour of the treaty and failure to do so could mean expulsion from the party. This response was posted by Peter Power on the J7 campaign website in response to our confrontation with him. The usual straw man tactics of throwing in stuff about the WTC and paid actors at the bus bomb, despite us only asking him who the company was and how they chose the stations they did for their drill.